PIG Full Dexterity Tactical (FDT) Alpha Gloves - Black - Medium | What Should I Say? Over 2 years in the making, the PIG Full Dexterity Tactical - Alpha Glove (Patented) offers ground breaking dexterity while providing much needed protection from the rigors of tactical work. We are proud to now offer the ALL-NEW ALPHA TOUCH model that is Touch Screen compatible! The PIG design team partnered with the pre-eminent designer from an industry that actually makes gloves that fit really well- the sports glove industry. Featuring several industry firsts, the FDT-Alpha allows unfettered access to all your firearms controls and manipulations, without the overwhelming bulk of unnecessary padding and layers. 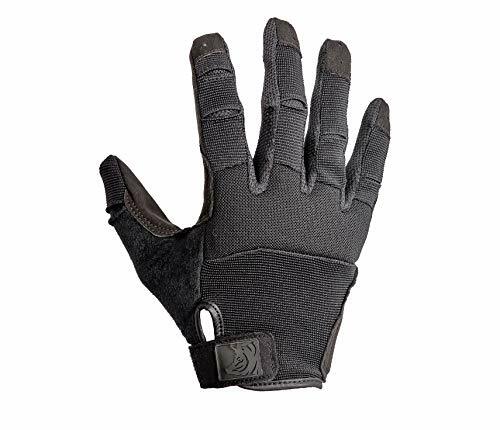 The PIG FDT-Alpha/Alpha Touch Gloves are a consumable product that will provide the user with the best tactile dexterity available in a tactical glove, and should be worn to destruction, then discarded and replaced. SPECIAL OPERATIONS PROVEN- PIG FDT Alpha Gloves have been proven in combat by US Special Operations soldiers who require MAXIMUM dexterity for fast & accurate shooting with Rifle AND Handgun! The PIG FDT Alpha (original), Bravo (FR) and Delta (minimalist) Gloves have ALL been fielded by Special Operations Soldiers & Units. We even offer women's specific versions (Charlie & Echo models). COMFORTABLE & DRY HANDS- Roll-over fingertip design means no more jammed seams under your fingernails! The venting material on the inner fourschettes are ventilated for maximum wicking. Outer forschettes are synthetic suede for durability.